iMovie - All about apps in YOUR classroom! iMovie for ISO devices (iPad, iPod Touch, iPhone) is an incredible app to use in the classroom. With an iPad or an even smaller iPod touch or iPhone equipped with iMovie you can put in to students hands a mobile movie studio that a few years ago would have cost hundreds of dollars for the software alone. Students can share/publish finished iMovie projects as movies to your camera roll or as podcasts that are accessible on any number of platform via YouTube, Facebook, Vimeo, or through iTunes. Students can use iMove to construct video reports dealing with core curriculum. 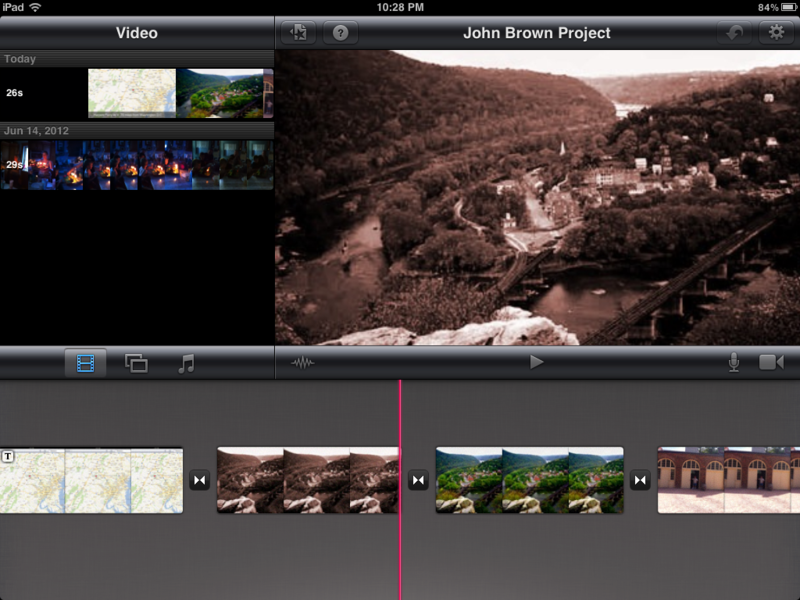 For example in a Social Studies class students could use the iMovie movie presets to create video reports. Inherent in these video productions would be the expectation that students incorporate cross curricular skills to develop scripts to shoot from. Part of good curricular practice for class use of iMove would be that construct story boards that will help guide students during the filming process. 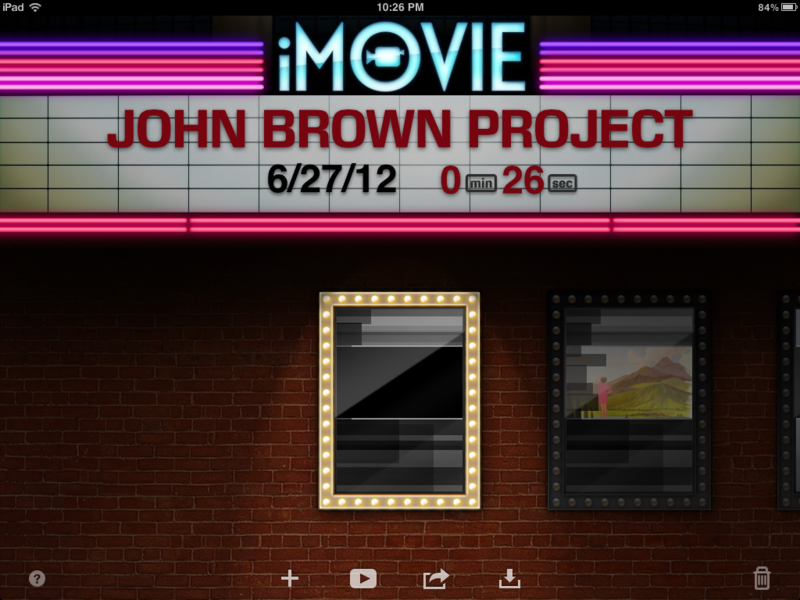 Students could use iMovie to take and defend a position on a controversial historical figure such as John Brown. Students could create a newscast that would argue if he was a hero or a terrorist. In a science class iMovie could be used to judge the results of a science experiment. Video could be used to evaluate why in an aerodynamics experiment a rockets would have better velocity based upon its design. In a Mathematics class students could create video projects that would examine everyday objects found on a school as examples of slope. Students could use examples of slope to demonstrate and differentiate the differences between rise and run. In a Language Arts class students could use iMovie to create video essays that could Compare and Contrast their own experiences in early adulthood with the experiences of say Anne Frank. Students could employ iMovie in a Physical Education classroom to illustrate proper technique in shooting free throws. Or to perhaps demonstrate the relationship between good nutrition and better health. Another great use of iMovie would have the students illustrate the Bill of Rights using everyday examples in media today. Students could also create audio visual examples of how the Supreme Court has interpreted those ten amendments over the years. A good example is perhaps the students could dramatize the case of Tinker v. Des Moines that dealt with free speech in school, and how it might affect their school behavior today. In Social Studies Students could record a newscast to explain the Emancipation Proclamation and to discuss its effect on the outcome of the Civil War. In a Language Arts classroom students could create video that would identify and give examples of a standard plot line (having a beginning, conflict, rising action, climax, and denouement), and point of view. a. Include the main ideas of the event or article and the most significant details. b. Use the student’s own words, except for material quoted from sources. Convey a comprehensive understanding of sources, not just superficial details. The use of iMovie to create daily response to literature would help students demonstrate understanding by recognizing main ideas, in addition to paraphrasing an author’s written work. Students could use iMovie to create visual clues to help in recalling material. In addition students could use iMovie to define vocabulary lists by combining vocabulary with photos or illustrations that will help with memorization. Another good use of an iMovie equipped device would be to designate a student/reporter a day per class to quickly walk the room and asked students to put into their own words the key ideas and concepts for the day. Theses could then be combined into perhaps a weekly Friday review or used as review material for testing. Also when using Cornell Notes this same quick video review works well with students summaries to help students reproduce a days material in their own words. Questions on how to integrate this app? Email Mike Cloutier with any questions you have about how to use this app in your class, or if you would like more specific suggestions for how you can use this app in your content area. Here are some screen captures of student work.